Playing with some new goodies from Stampin' Up! using the Splitcoast Stampers Sketch Challenge #286 and the Clean & Simple sketch #95. What do you think? For the SCS card I turned the sketch on it side and used the Simply Scrappin' "Happy B-Day" kit -- awesome colors and fun (easy!) peel-and-stick images. The whimsical "Playground" designer buttons complement the patterns in the designer paper perfectly. For the Clean & Simple sketch I used the new Daffodil Delight, a beautiful crisp shade of yellow that's part of their new color re-do. 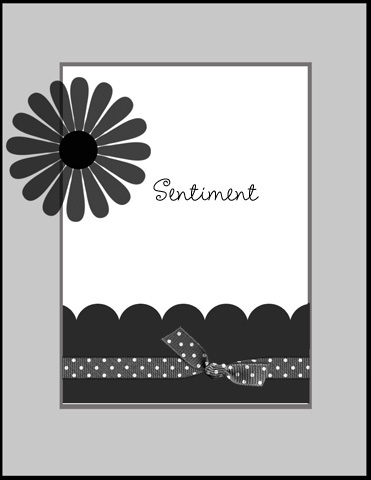 The sentiment and stem are from the soon-to-be-gone "Bloomin' Beautiful" stamp set and the flower is from a retired set called "Organic Grace". plus lots of tropical bright colors like Melon Mambo, Wild Wasabi, and Rich Razzleberry. The little flowers in the Razzleberry Lemonade Designer Paper give some pop as well as texture as a counterpoint to my homemade grass (just snip away!). Crystal Effects on the flower add shine. Thanks for looking, and hope you're enjoying a great Father's Day! In preparation for the new 2010-11 catalog coming out July 1, Stampin' Up! is retiring a ton of stamps, inks, designer paper, decor elements and accessories. If there were any things you've been holding back on purchasing, take a quick look at what will be coming "off the shelves" to see if there's anything you can bare to not add to your stash. All products are shown online and can be ordered 24/7 through my SU! website. Some of my favorites -- Bloomin' Beautiful, Close As a Memory and Warm Words -- will still be my "go to" stamps, I'm sure, but I can't wait to see what's in the new catalog. As a SU! demonstrator I was able to place an advance order which should be here next week. Woohoo!! Let me know if you want to get a sneak peak as well, orders can be placed in July. I am really enjoying my new "Watercolor Trio" clear-mount stamp set from the Stampin' Up! Summer Mini catalog. Who knew clear mount stamps could actually help a space-challenged stamper like myself align my images just where I want them? I don't think I'll ever go back to wood mounts, LOL. I had fun making this card because I used my Ornament Punch to create the vase -- just snipped the bottom to make it straight and used Hidden Garden rub-ons in white (now for sale in the Clearance Rack) for the pattern. Hope you enjoy my card and find a little inspiration of your own in it -- Happy Stamping!